Rubbish which was left on Hastings Pier for a number of hours after a music event over the weekend has blown into the sea, according to Hastings Borough Council. On Saturday (September 8), Pier Jam Part Three was held on Hastings Pier featuring music from drum and bass and dubstep heavyweights Chase & Status, alongside BBC Radio 1’s Danny Howard and many others. However, on Sunday morning (September 9), pictures circulated on social media showed large quantities of plastic – mainly empty cups and bottles – strewn across the pier. Following the news, a Hastings Borough Council spokesman said: “We are disappointed that such a mess was left after their event, which has now blown into the sea and made the problem worse. Joshua Speer, from Hastings, was also concerned about the litter landing in the sea. He said: “Why wasn’t this collected last night after the event, rather than being left overnight to blow around and gather? Most importantly, how much of this went into the sea?! Hastings is a fishing town. Mark Dyson said it was ‘particularly ironic amidst the current awareness around the problem of plastics in our seas and oceans’ that this was allowed to happen. Responding to this criticism, a spokesman for One UK Events, which organised the clean up operation, said: “The event was hugely successful but unfortunately we were let down by over 17 staff members not showing up on the day. 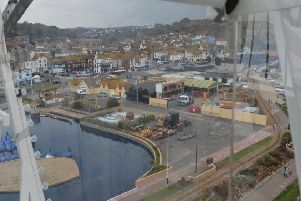 Rubbish points were installed around the perimeter of the pier. The entire event space had Heras fencing installed to prevent any rubbish being blown on to the beach. The spokesman said One UK Events did not want to leave the rubbish until after the weekend so recruited local firm Fineshine to help with the clear up. The spokesman added: “The local firm Fineshine undertook an incredible task and got everything cleaned the following day for which they should be commended. Among the criticism aimed at the event organisers was the impact the rubbish would have in the sea. As a result, One UK Events said the full cost of the wages of the staff that did not show would be donated to the charity Plastic Oceans. The spokesman said this was ‘in case any of the rubbish blew onto the beach over night’.